Holi is a spring festival also known as the festival of colours or the festival of love.t is primarily observed in India, Nepal, and other regions of the world with significant populations of Hindus or people of Indian origin. The festival has, in recent times, spread to parts of Europe and North America as a spring celebration of love, frolic, and colours.Celebration of the various legends associated with Holi reassure the people of the power of the truth as the moral of all these legends is the ultimate victory of good over evil.The colorful festival of Holi is celebrated on Phalgun Purnima which comes in February end or early March. Holi festival has an ancient origin and celebrates the triumph of 'good' over 'bad'. The colorful festival bridges the social gap and renew sweet relationships. 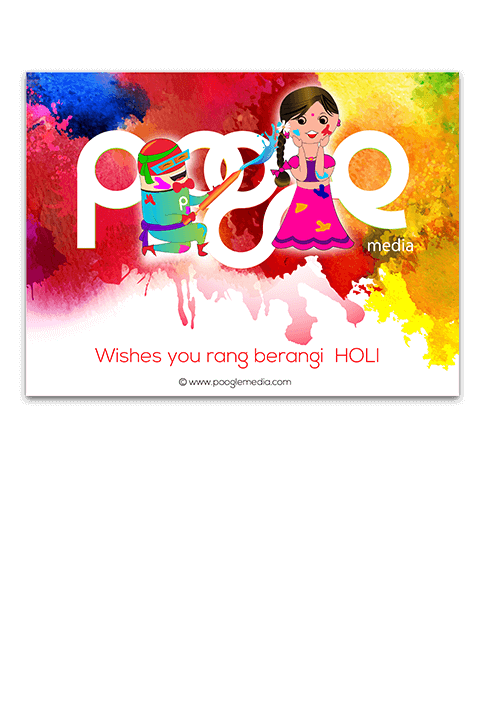 On this day, people hug and wish each other 'Happy Holi'.Poogle Media designed this creative and colourfull doodle with splash of colours to mark this day.